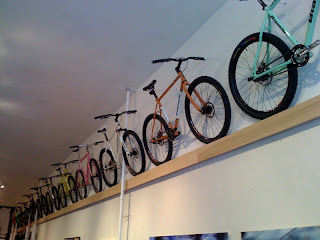 Back in February when I took a business trip back to the Midwest, I was fortunate to visit One On One Bicycle Studio in Minneapolis. Part espresso bar, part art studio, part bike shop, part junkyard and all cool, One On One is one of the few bike shops that I could hang out all day in. Run by Gene O, a former Bianchi pro mountain biker and winner of the Chequamegon Fat Tire Festival classic MTB race. 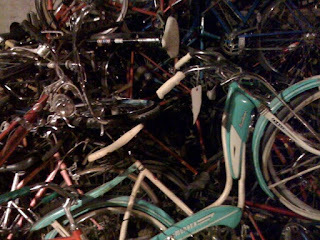 Here's a wall of Gene's Bianchi single speeds adorning the coffee shop/bike shop. 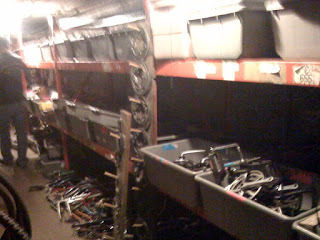 Bins line one wall with parts sorted by type. Shifters, cranks, stems, seatposts, etc. Everything was reasonably priced. While you're not going to find vintage Campagnolo parts down there, they should have what you need to keep a mid-priced mountain or commuter bike on the road. "Decent", non-damaged frames are also available. They may be ugly and dated but are completely serviceable. 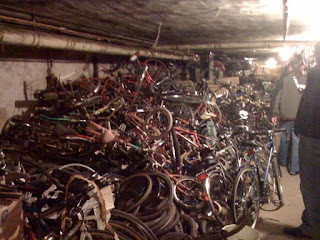 Also downstairs is a pile of semi-collectible bikes. These bikes are sold complete, thankfully not to be parted out. 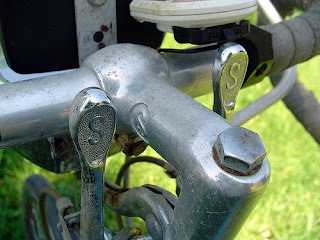 I didn't really need any parts, but did score a couple of classic Schwinn stem-mounted "S" shifters like the ones pictured below for $3 each. Score! 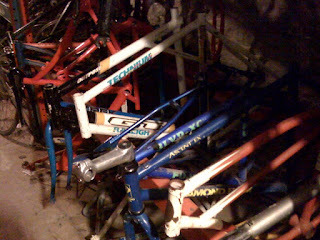 I spy with my little eye a triple triangle in that pile 'o frames!